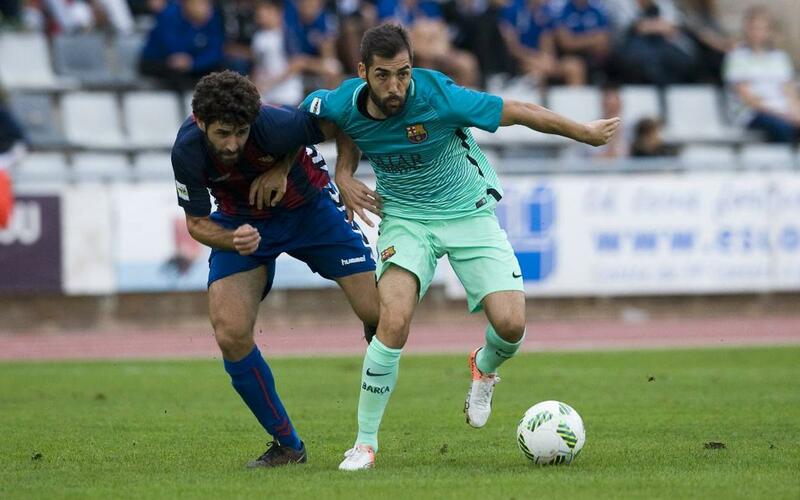 Barça B did everything but score on their trip down the coast to Gavà and ended up suffering a 1-0 defeat despite dominating the possession and having countless goal opportunities. The woodwork, an outstanding goalie and some rotten luck meant the scoreboard remained unchanged until the 78th minute and then Gavà snatched a winner from a fine strike by Boris to clinch the three points. The defeat was all the more frustrating considering that the home side played the entire second half with ten men after Mario Gómez was red carded for elbowing Dani Romera during an aerial challenge – an incident that meant the latter needed medical attention, but he was eventually able to play on. If Barça had dominated the first half, with numerical superiority they absolutely bossed the game, and if it hadn’t been a series of quality saves from Gavà keeper Craviotto would have taken a deserved lead. Fali did find the net, but the lineman’s flag had gone up for offside. Gavà’s goal, brilliant as it was, came from their only truly menacing attack of the entire second half. Barça pushed hard for an equaliser, and came maddeningly close when Abeledo struck the ball onto the crossbar and there were unheeded claims that the ball had bounced over the line. All in all it was an exasperating end to a game Barça really should have won – but it was just one of those days when nothing went right. All the same, they stay in the promotion zone with fifteen points.